This sandstone statuary was created by Czech sculptor of the late-baroque period, Ferdinand Maxmilian Brokof, in 1714. It is situated on Prague's famous Charles Bridge, the balustrade of which is home to 30 statues and statuaries; this is one of the most popular, the largest and most expensive of them all. 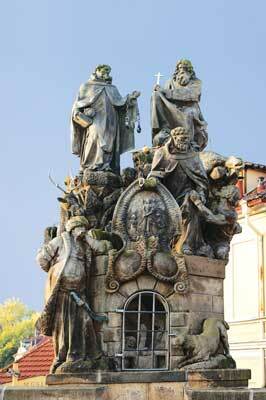 The Statuary of the Trinitarians depicts the French founders of the Trinitarian Catholic Order; St. John of Matha and St. Felix of Valois; as well as the Slavic patron St. Ivan, whose presence in the statuary remains a subject of debate. The Order, founded at the end of the 12th century, were known for raising money to emancipate Christian slaves from their captors during the Crusades. At the top stands St. John on the left, with the chains of a freed captive, money for their freedom and a Bible. Kneeling beside him is St. Ivan with a crucifix. Below, St. Felix of Valois holds the cartouche with one hand, and with the other, helps a freed prisoner loosen his bonds. The slain stags symbolise the three saints' hermit status, as well as the story of St. John's vision of a white stag with a red and blue cross between its antlers, which subsequently became the Trinitarians' emblem. The base consists of a caged prison with two despairing Christians within, guarded by a Turk and a dog. During times of political changes in Czechoslovakia in 1945, 1968 and 1989, the bars of the prison cell were ripped out as a symbol of freedom. If you're ever in Prague, the Charles Bridge is a must-see for the many inspirational sculptures, each rich in history, symbolism and masterful skill.